Your property was built before 1924 or after 1982. 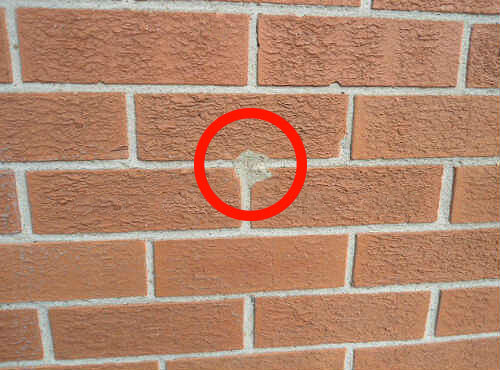 The walls have already been filled with blown Insulation – you will see refilled holes as highlighted by the red circle in the image. There are any signs of damp on the inside or outside of the walls. This can be rectified before applying for cavity wall insulation. The property is timber/steel framed, concrete or stone, however you may be able to insulate them in the same way as a solid wall – contact the National Insulation Association (NIA). Refilled hole in wall with blown insulation.